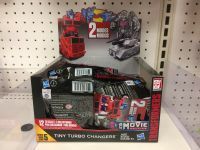 The small and fun new Transformers Tiny Turbo Changers Wave 5 figures, first seen in Hong Kong, finally made their way into US retail. Time to check your local Target stores to try to find them! Happy hunting! Series 5 has also appeared in Canada at some WMs. C$3.92 each. Hard pass on Hound. He has no camo paint at all and no cigar shape paint either like the pics show. He is a lighter green of the previous mold but exactly the same. New Megatron and OP are decent/good. As are Long Haul, Arcee and Scorponok. Topspin is an Arms-Former. All but Arcee came with paper inserts. No idea where her paper was. KSI is a near paintless repaint of Soundwave. Crankcase repaint as well. Hound is another repaint from the previous releases. CJ took the worst BB mold with legs that barely work and painted it red. Purple Megs plane can pass as a Galvatron. Blue Steelbane is cool if you missed the Target 3 pack version. They're cute. I'd totally grab Arcee and Longhaul if they come to Wally-World. … and land of Oz is sitting on wave 3. Some grocery retailers are still stocking w1 &/or 2. The Toyworld website is claiming to have Wave 4, but I havent seen them in stores yet. Wave 2 came out here nearly a year after it was supposed to so I haven't lost hope yet. Found them at a Target in Minnesota today. Got Prime, Long Haul and Skorpy. Wanted both Megatrons but they were gone. Prime is my favorite TTC so far, he looks great and has a unique and fun transformation. Has anybody found these in the wild, yet? Only a few west coast sightings at Target that I know of so far. I expect them to show up somewhere strange like Kmart, Kroger or that Calendar/ Toy store at the mall. These have the same UPC barcode (630509643264) as the Series 3 and 4 figures. You can see the barcode in the photo in the first post of this thread! Anybody have the DPCI for these, or a picture of one of their barcodes? I didn't find these originally; that was TFW2005 member NeoMirage. This looks great! Steelbane is definitely on my list now. I wonder if any of the other figures in this wave have different decos from the stock renders. The other TTCs I bought (Arcee, Cliffjumper, Megatron[tank and Shadow Spark], Scorponok, and Optimus) seem to be pretty similar to the renders. Not sure about the other 5 because I didn't get those. For those of you who want Iron Forge Steelbane: his color scheme looks nothing like the CGI renders on the box.He's actually a much lighter blue a la Cybertron Brushguard.Here's a couple pics. View attachment 28233353 View attachment 28233352 For those of you who want Iron Forge Steelbane: his color scheme looks nothing like the CGI renders on the box.He's actually a much lighter blue a la Cybertron Brushguard.Here's a couple pics. OK, adding this to the first post. So, it's safe to say we have the complete list of codes now? ?